I often like to joke that salt cod runs through my veins, but the reality is that I actually don’t make fish at home all that often. Not because I dislike it (quite the opposite, in fact), but rather because I always seem to forget to swing by the fish counter when I’m doing my grocery shopping. These tasty little fresh salmon cakes have me changing my tune, though. They’re made with fresh sockeye salmon, one of my favourite options for fresh, sustainable fish. Unlike Atlantic salmon, which is usually farmed and available pretty much year-round, fresh sockeye is caught wild and is available for a limited time only – usually between May and mid-September – and is very much worth the hassle of hunting it down. Thankfully, it’s actually pretty easy to pick up fresh sockeye. I just like to live on the edge, I guess. 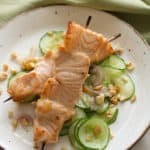 I still love Atlantic salmon and that rich buttery thing it has going on, but sockeye has a leaner, meatier texture that makes it perfect for recipes like salmon burgers or kebabs. Not to mention that its intense coral-pink colour looks amazing, no matter how you choose to prepare it. 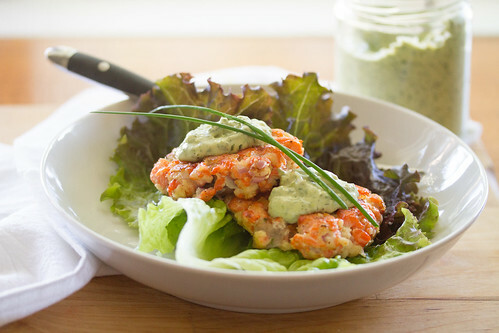 After going to such lengths to get some sockeye, I wanted to make something that would let their delicate flavour and beautiful colour shine, which is exactly what these simple fresh salmon patties are designed to do. First, I started by going old school, and chopped the fillets by hand to keep some of that lovely meaty texture. Then I went with very minimal seasoning, just a little salt and pepper, plus fresh lime for a pop of citrus flavour. The only other adornment is the lovely pale green dollops of aioli flavoured with the trifecta of fresh tarragon, parsley and chives that is better known as Green Goddess. I chose to go with small two-bite patties that could be served on a bed of tender lettuce for a simple, fresh hot-weather lunch. However, they’re pretty dang amazing made into full-sized patties and nestled into challah buns for a gourmet salmon burger. One thing’s for sure, though… one bite and you’ll be (wait for it…) hooked. Ba-dum-ching. Tip your waitress. I’ll be here all week. And try the salmon! These simple salmon patties get their meaty flavour and brilliant coral-pink colour from sockeye salmon. 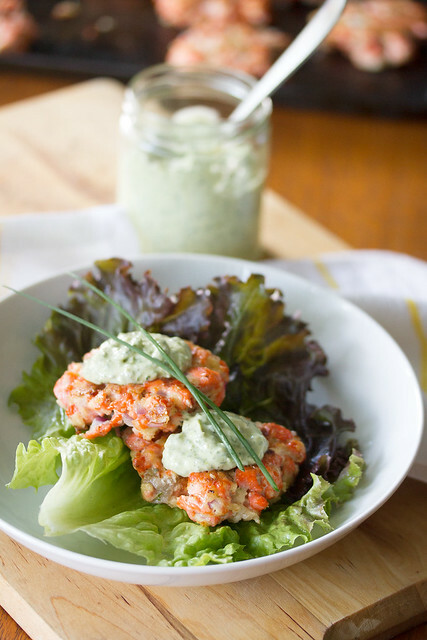 Top them with dollops of creamy Green Goddess aioli for a perfect hot-weather meal. Using a sharp chef’s knife, remove the skin from the salmon and discard. Finely chop the salmon - you're aiming to preserve some of the texture of the fish (as opposed to using the food processor, which I find tends to reduce the fish to a paste), but chop it finely enough to hold together if you gently form it into a ball. In a large bowl, stir together the salmon with panko, egg, lime juice, lime zest, salt, and pepper. Mix gently until everything is well combined. Shape the mixture into 8 equal-sized patties. Arrange on a baking sheet and chill for half an hour to help them set up. While the patties are chilling, prepare the aioli. Using a food processor, pulse the parsley, chives, tarragon and garlic until finely chopped. Add the mayonnaise, white wine vinegar and anchovy paste. Process for a minute or two, or until smooth, stopping occasionally to scrape down the sides of the bowl. 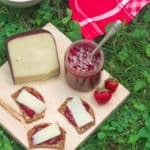 Pour into a small mason jar and chill until ready to use. Heat the olive oil in a large heavy-bottomed skillet over medium-high heat. Pan-fry the patties for 3-4 minutes per side, or until golden brown and crisp. Not only does the recipe itself look great, but I’m very impressed by your presentation. Very, very classy! The color of this salmon is blowing me away! I love that you turned it into (what I’m calling them) gourmet high class salmon patties. These babies look fabulous! I never make fish at home! I don’t even really have a reason for it other than it never really occurs to me to make it. Thanks for the delicious reminder! I love sockeye salmon. 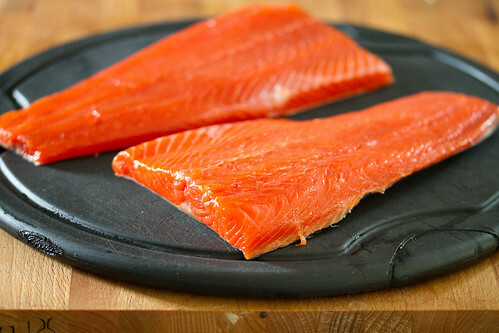 I pretty much love all salmon, but sockeye is the best for me. My dad loved to fish and would make treks for salmon fishing often. Even went to Alaska on a fishing trip once. We always had salmon in abundance in summer. Then he’d freeze it for winter. I can’t wait to try these. Salmon patties rock. I wish I was chomping on this right now. It looks delish and your photos are amazing. 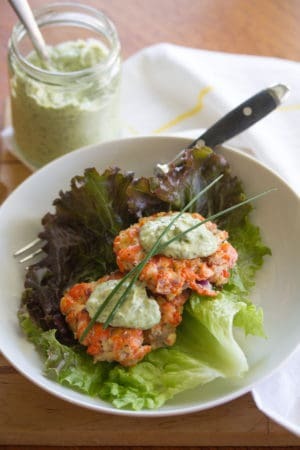 I love sockeye and these patties are a yummy looking way to prepare it, especially with that amazing aoli. Will try this for sure. Fabulous! Nothing can compare to sockeye, right? 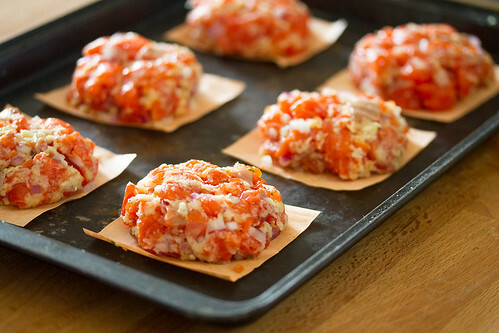 Making patties is a great way to stretch this top-notch salmon! Your tale of getting the sockeye literally made me laugh out loud. Braving that area on bike during not only Canada Day but the crowds of Pride? You deserve a medal, Isabelle. These cakes look divine. The green goddess aioli sounds fabulous, too. I have some salmon in my freezer, might be time to break it out! I’m so glad you were able to get that fresh sockeye! This looks like a great recipe!